Helvetica 10pt, Black (#000000 / RGB:00,00,00) is specified for the body text of your email since most users already have Arial on their computers. This will ensure a consistent look no matter who the recipient is. Using unorthodox or out of the ordinary font selections can detract from the brand image we wish to communicate and may not display as intended when viewed on the recipient's computer. Because font families of the same face (Helvetica) may display differently on different systems depending on the specific version (Truetype, Postscript, etc. ), you may need to bump the font size up to 11 or 12, however most computers operating Windows XP with default set-ups should stick to 10pt. Arial is an acceptable substitution if you do not have Helvetica. Phone Numbers may auto-convert to blue hyperlink in some mail programs and devices (so, there's generally nothing you can do). Website Links should be colored dark red (#990000), though may auto-convert to blue in some mail programs and on some devices. Font Sizes are approximate and unique to your computer or device platform, so it's most important to approximate the same size of fonts you see below in the graphic screenshots. * NEVER use wallpaper background graphics in your university email communications. * NEVER use alternate fonts faces, sizes or colors. * NEVER list more information than specified. NOTICE: The information contained in this message may be confidential and privileged and is intended only for the use of the individual or entity named. Some information herein may be protected by the Federal Family Education Rights and Privacy Act and cannot be further disclosed. If the reader of this message is not the intended recipient, or the employee or agent responsible to deliver it to the intended recipient, the reader is hereby notified that any dissemination, distribution or copying of this communication is strictly prohibited. 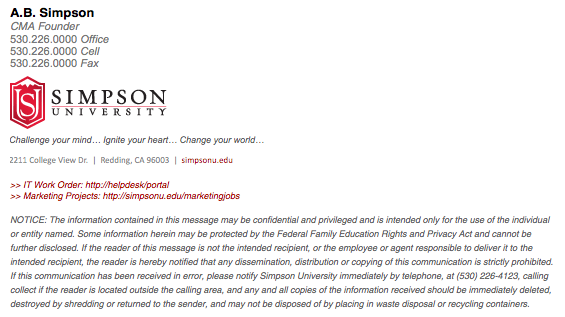 If this communication has been received in error, please notify Simpson University immediately by telephone, at (530) 226-4123, calling collect if the reader is located outside the calling area, and any and all copies of the information received should be immediately deleted, destroyed by shredding or returned to the sender, and may not be disposed of by placing in waste disposal or recycling containers. Please refrain from using quotes, bible verses and quotes as the footnotes to your SU email signature, and reserve this for your personal email. 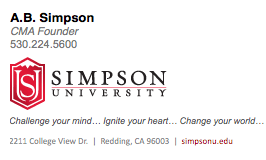 If the absence of such content from your signature prevents you from performing your job with excellence, please contact the marketing department at webjobs@simpsonu.edu to provide a rationale for these uses. If approved, the content must be formatted in the footnote style listed above. DIRECTIONS FOR DOWNLOADING EMAIL SIGNATURE GRAPHICS: Right-click or option-click on any of the signature graphics below to download and save to your computer in order to insert into your email application. Remember to select "HTML" and NOT "Plain-Text" as your choice for viewing and sending emails.